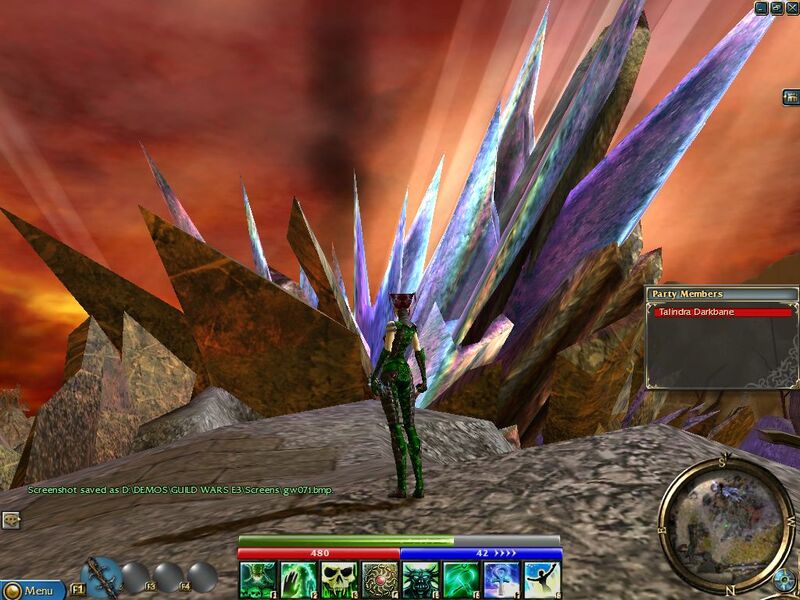 It’s time for more “new” Guild Wars screenshots! I really like that I’m finally posting all these online, anyway, so this series definitely will continue. If it gets enough parts I might add another top-bar page for the GW screenshot links, instead of having a whole category in the table of contents… we’ll see. On that note, this time I decided to cover only one event, because I’ve got over 60 screenshots and that’s about as many as I want in one post. For whatever reason, I took a bit over 80 screenshots of this BWE, the most I took of any of the betas not counting all of those character creation screen shots I did in the first two tests. And now, I decided to post about 3/4ths of those; from the past updates, I posted most of the E3 for Everyone shots, but lower percentages of the October to February ones; some just weren’t worth posting. 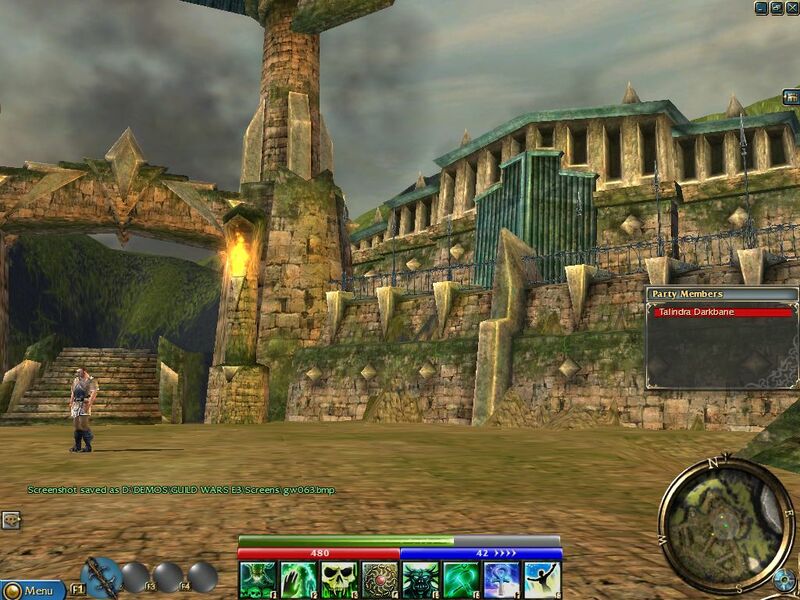 The same is true here, but even if in some ways they’ve gotten less interesting, as the most different things versus the game you can still play today slowly are being removed in favor of the Guild Wars we know and love, as of this update release is still a few months away, and the game is still very much unfinished. 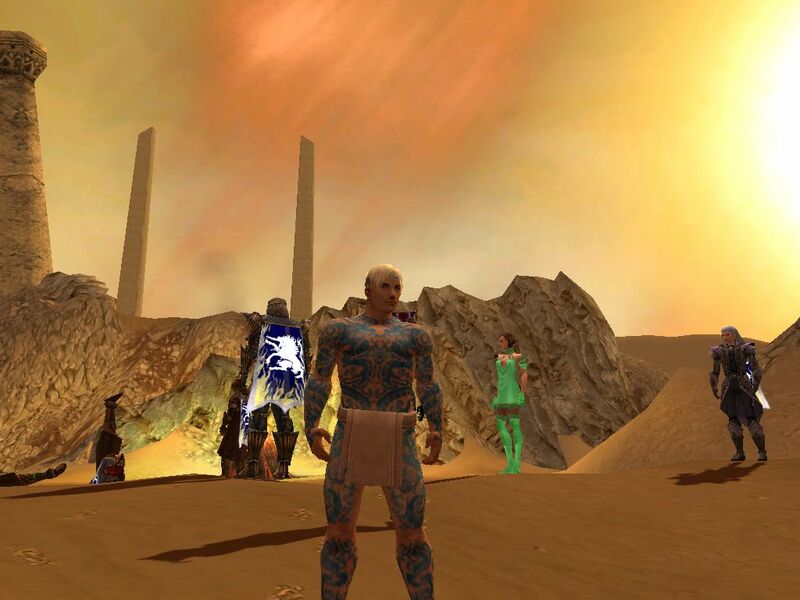 So, on to the March 2005 Beta Weekend Event! 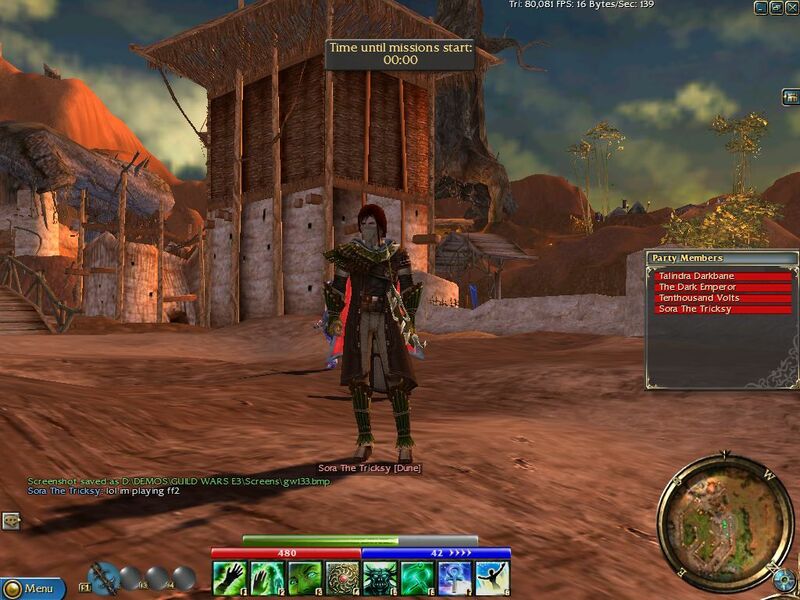 As Guild Wars got closer to release, more and more of the final game came into place. 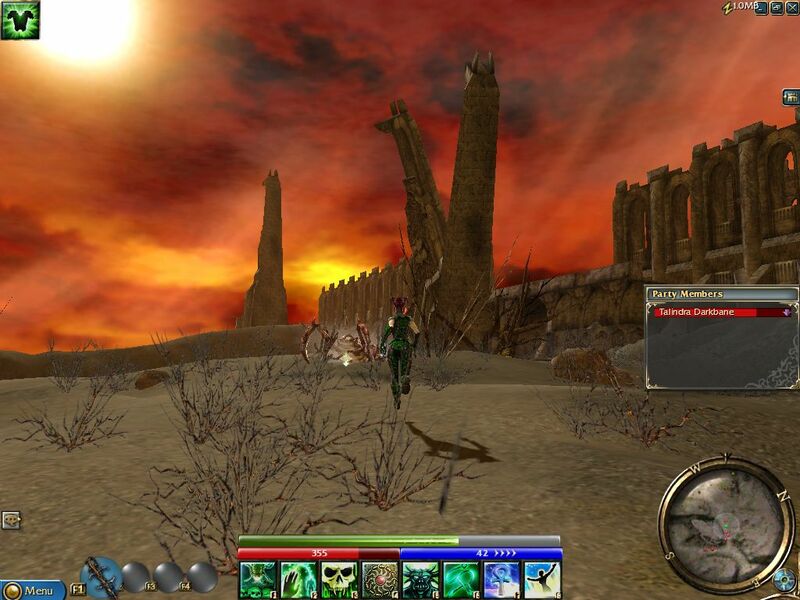 As such, this second-to-last beta mostly refined the game as it was, instead of adding major new content. The main new addition was a newly improved PvP-only character type and guild halls, forts that guilds can buy to fight in during guild-versus-guild battles, or hang out in anytime if you want. Along with that guild versus guild battles were also added, though I’ve never done that since I never have been in a guild large and interested enough in that to do PvP together. 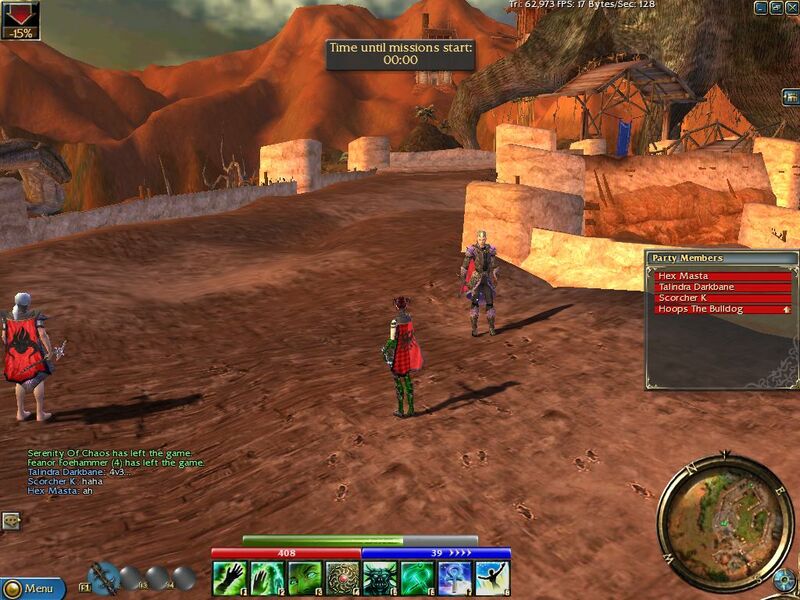 Other than that, many more quests were added to the PvE game. 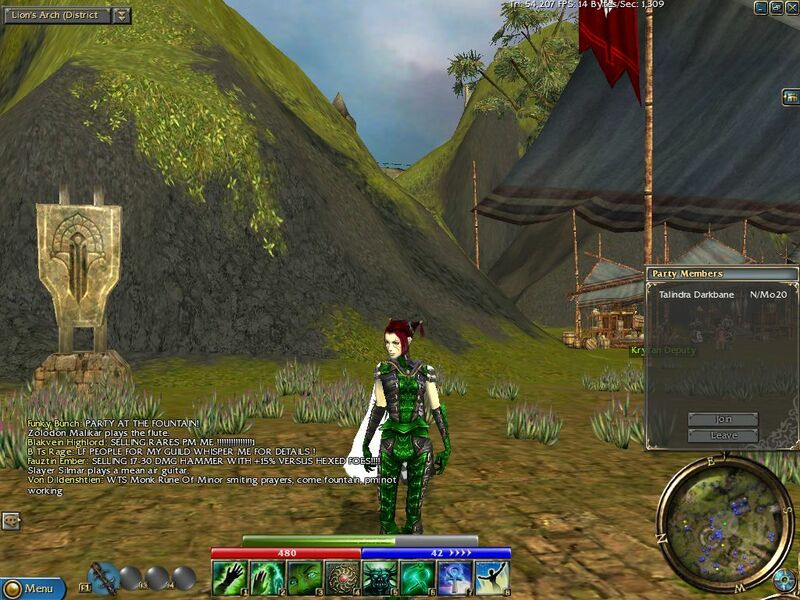 The character creation interface was also revamped, though I don’t show that here. 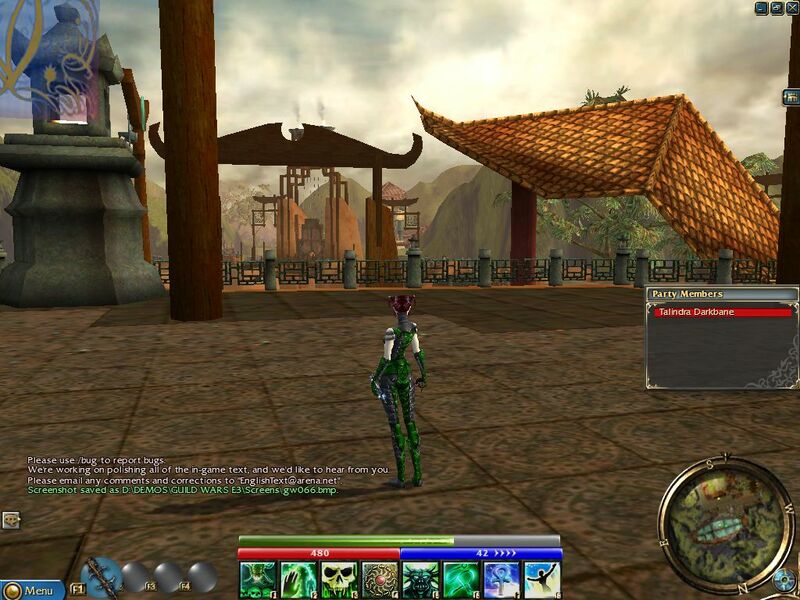 A listing of the changes is in this article here: http://gw1101.gtm.guildwars.com/events/press/interviews/fansite-friday-bwe5.php The rest of the interface is exactly the same as it was in February, though, so the final interface isn’t here yet; that will have to wait for April. Yes, the interface wasn’t finalized until just before launch. 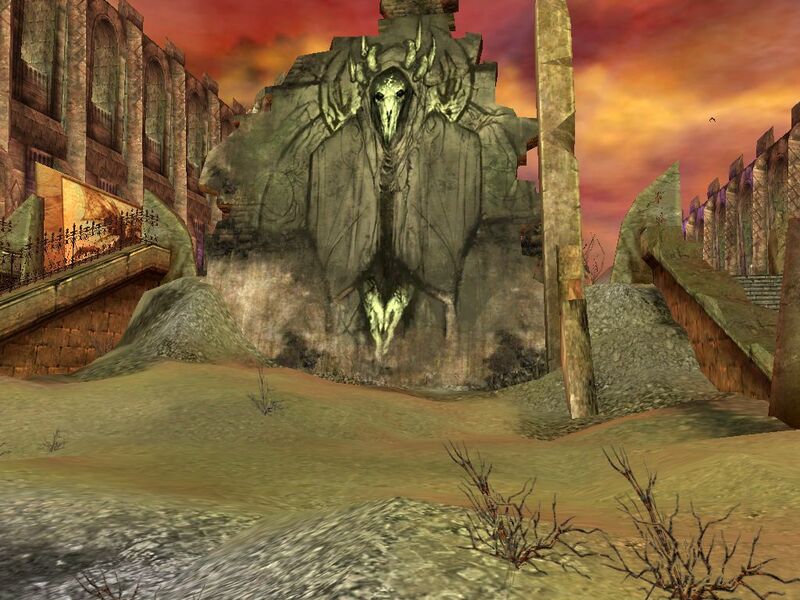 Other than adding guild halls, probably the thing this beta was best known for was its closing event. Probably the most famous of the Guild Wars beta closing events, this one sounds like it was pretty fun… but sadly, for whatever reason I have no shots of it, and instead spent the closing part of the beta in the random arenas. I had fun there, though, so oh well. I will say some more about this event at the end anyway though, with some links to others who did experience it. 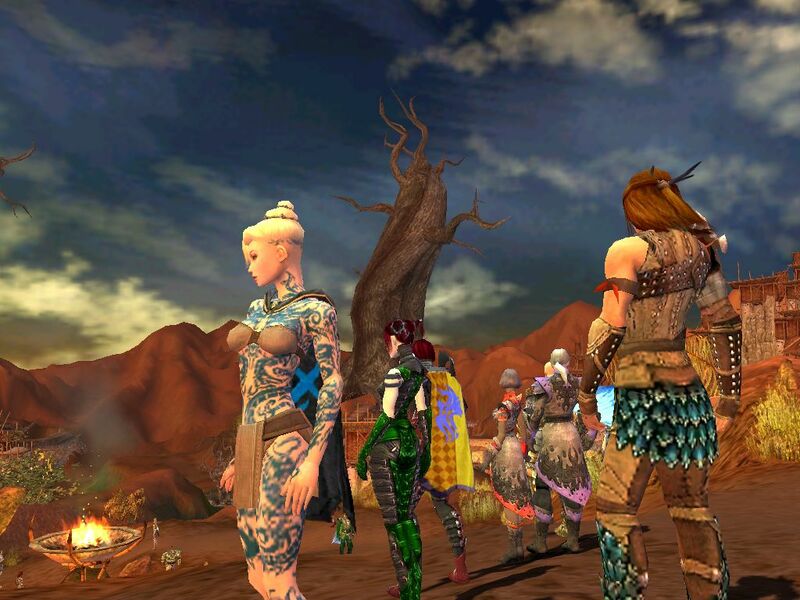 I do have a bunch of screenshots of the April final closing event, though, so look forward to that! 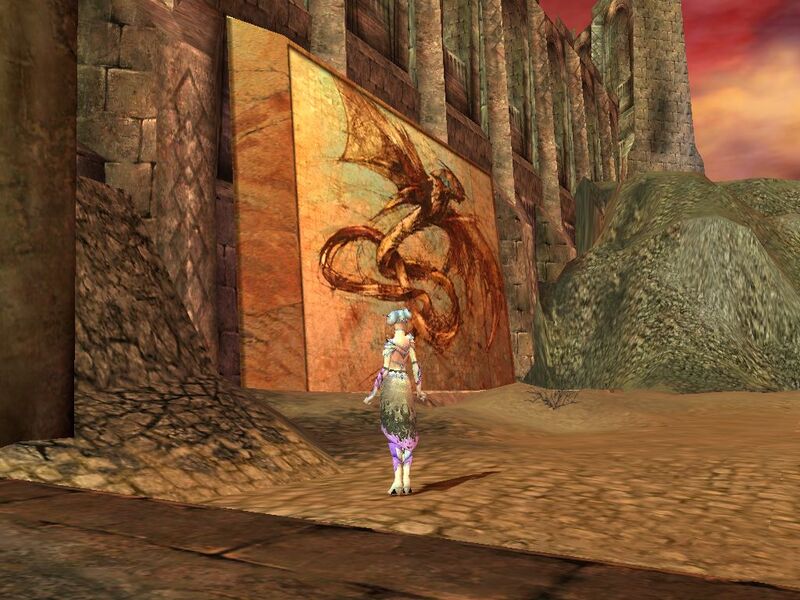 One thing I do have a bunch of screenshots of this time is scenery, including a lot of large paintings and other interesting sights in Ascalon. These things can still be seen in the game today and they’d look better now, but I decided to post lots of these screenshots anyway because the amazing graphics have always been one of the many things I love about this game, and what better way to show that than by taking screenshots of that and sharing them? I divided this set of images from the beta into three parts within this article. This first part is all shots of me playing as the character who had become my main, Talindra the Necromancer. On screen here, my character and some available henchies. Henchies are helpful but no replacement for human players. For PvE exploration, though, they’re usually fine. And now, back to Lion’s Arch. This sure isn’t too interesting of a shot, though… what was I thinking here, that it’s kind of interesting because it’s one of the few places in the original GW campaign where you are actually under a roof? The game is almost always set outdoors, apart from a few caves, after all. 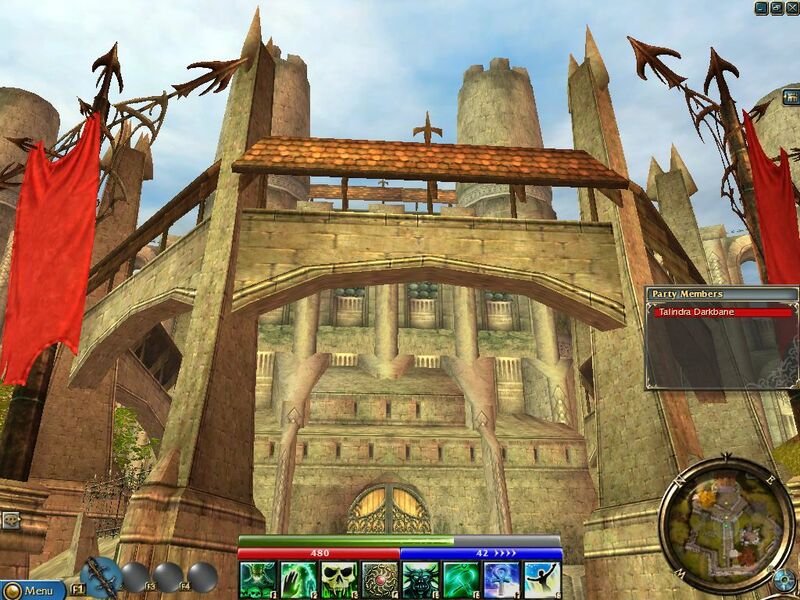 And now for a couple shots of the main addition this time, guild hall islands. 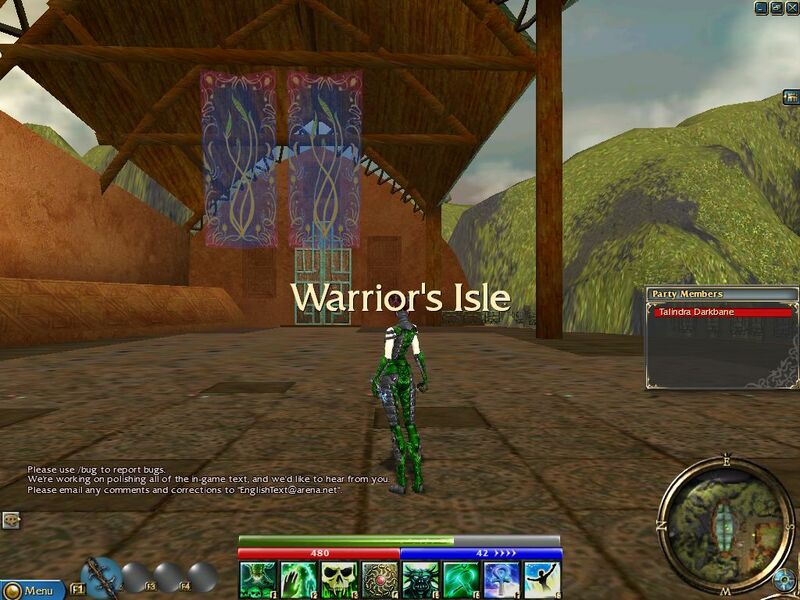 This is the first one they finished, the Warrior’s Isle. Buying one for your guild cost a bunch of money, but you could visit them to check them out, as I’m doing here. 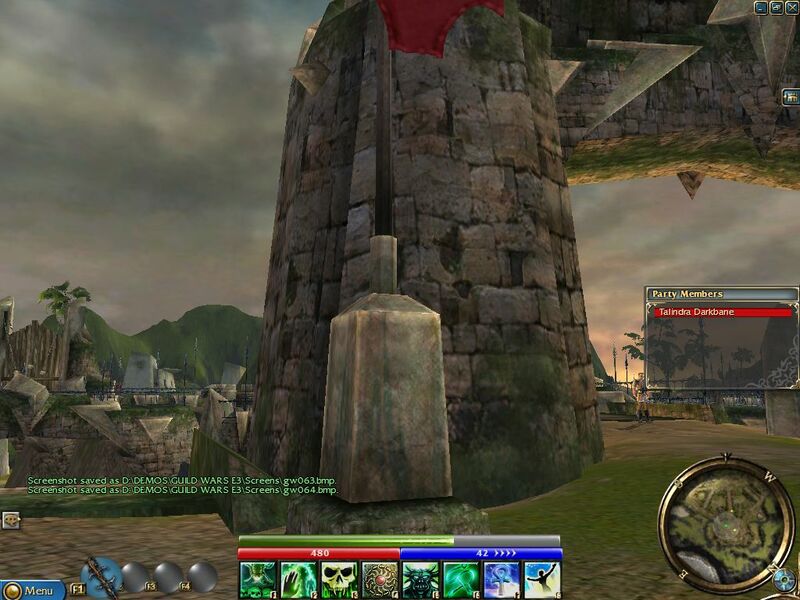 More of the Warrior’s Isle. The Asian architecture here presaged the art design direction of Factions and the Battle Isles. 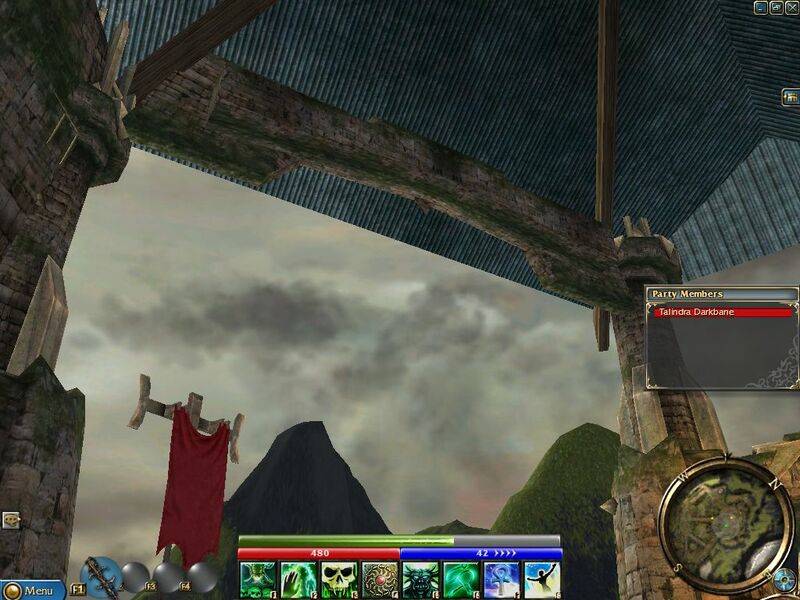 Destroyed houses like this sure weren’t in the original E3 for Everyone version of the Old Ascalon area! This was flat before the Searing! Necromancer Munne survived the Searing, though. But now, back to Kryta, and this particularly not-great looking loading screen. 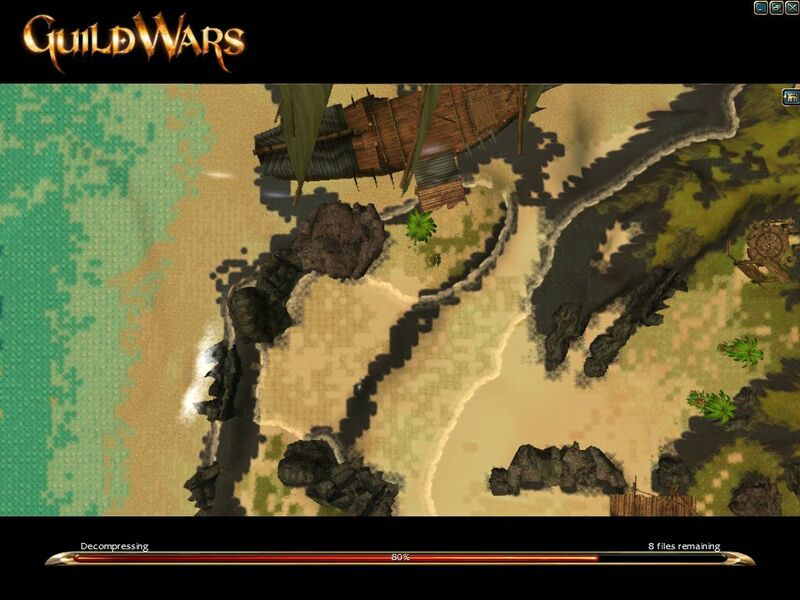 I get that it’s a straight, way zoomed out overhead view, but the end result looks very pixelated and kind of bad. Yes, anti-aliasing sure does make these character models look a lot better. 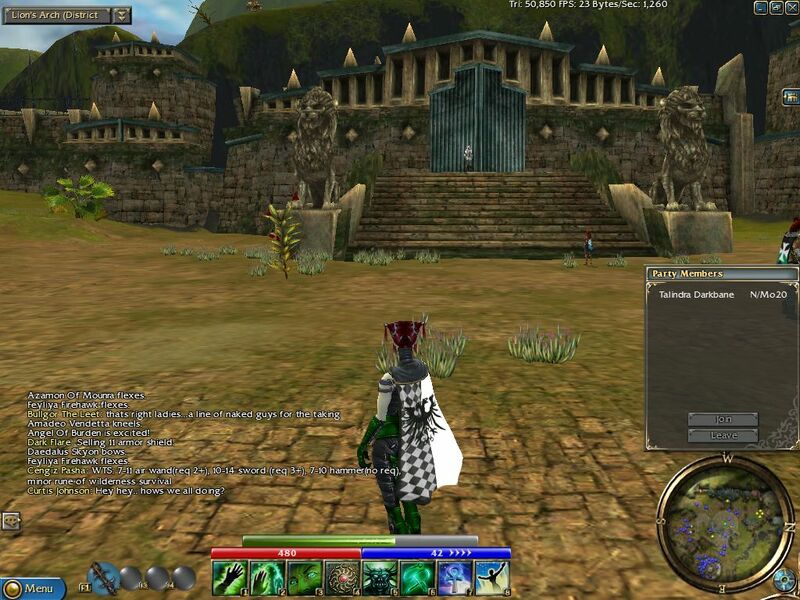 This is the Kryta random arena lobby area. And here I am in battle. Random arena matches are back to 4-v-4, which is probably the right number; the experiment with 6-v-6 random arena battles from some months earlier was not popular. We lost, apparently after several wins. Too bad, but it was fun while it lasted though. This mission at the end of the Kryta part of the game is skill kind of hard. It’s easier with other humans like you see here of course, but it’s not easy. And here are the results, they died. 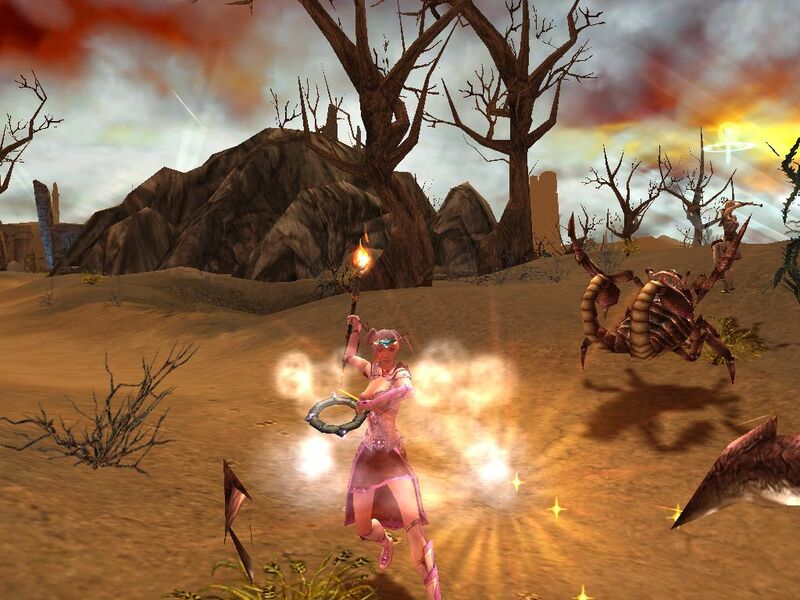 Swamps in Guild Wars are bad news, you take health degeneration all of the time while standing in them. So being at the edge, like here, and luring enemies to you is a good idea. And now, back to exploring with henchies. This whole scene is the kind of thing most improved by anti-aliasing, but look at that framerate! It’s pretty bad without it as you see here, on the 32MB GeForce 2 card that computer has in it. Regardless, foliage in GW is well drawn. There’s a lot of running through environments like this in GW, so this is a pretty nostalgic shot. 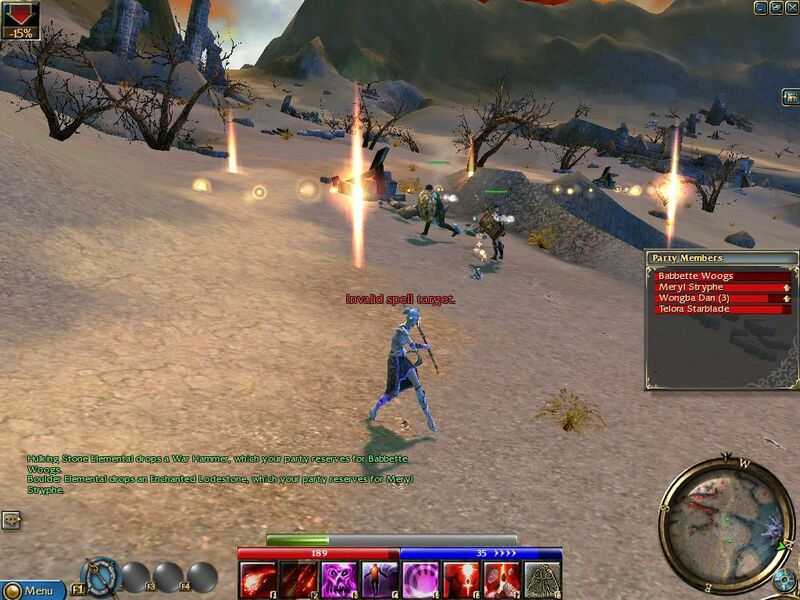 And here I’m playing one of the early Ascalon missions, with humans because it was easy to do that during beta. 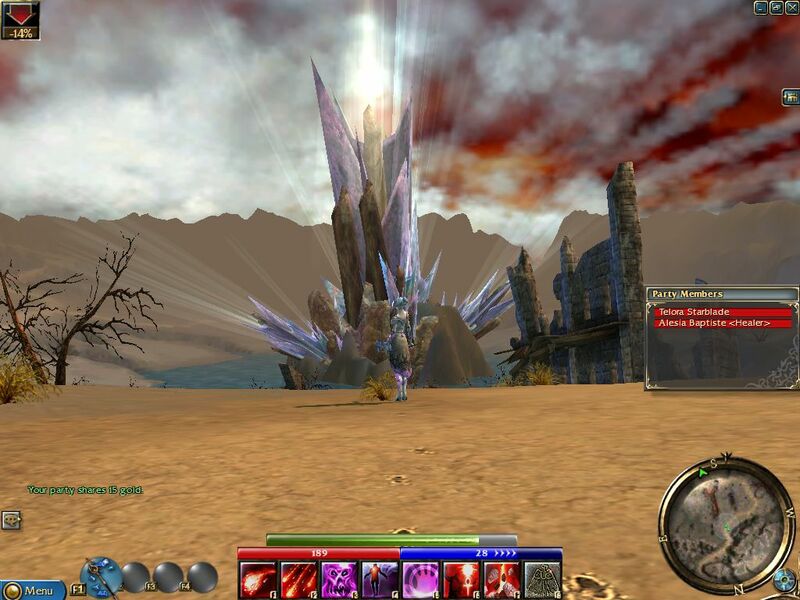 When you think about it, it’s kind of crazy how oversized things like scorpions are in Guild Wars’ world. A real scorpion as big as those devourers would be terrifying to say the least! Maybe Firestorm will help this clump of enemies out… … Yeah, I like Firestorm, when fighting things which don’t move out of the way that is. Heh. Melandru, goddesss of nature and the Ranger class. Green is my favorite color, so I like the color here the best of these. Dwayna, goddess of healing and the Monk class. Grenth, god of death. Despite his looks Grenth is not evil. though. Severe, but not evil. 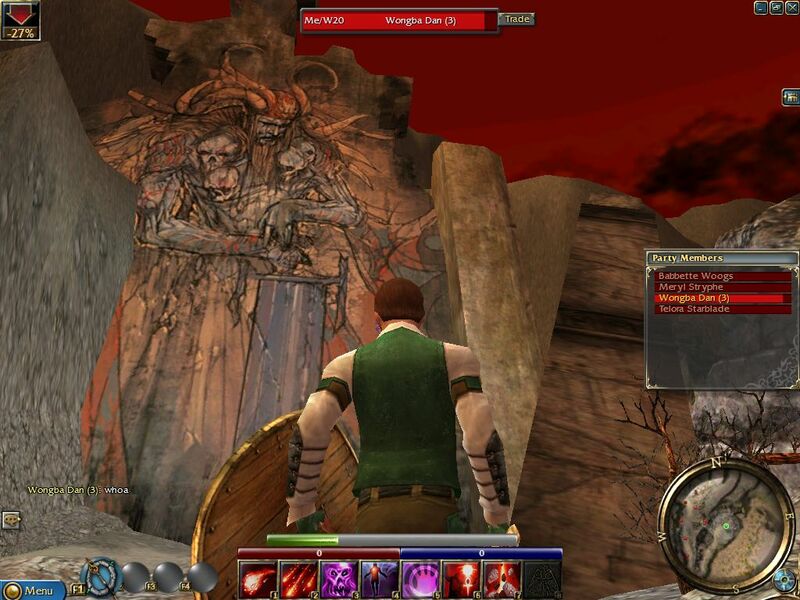 I like that GW does not go for the videogame-standard “the death god is evil” plotline. A dragon, or perhaps wyvern since dragons are in quite short supply in this game, if there even are any. And here we get a close-up of just how scary Devourers would be in person! I’ve bought one new piece of armor and probably will be fine against weak foes like this, but they look scary at least. Using a regular attack, prsumablye because mana ran out, or because I was moving the camera for this shot instead of hitting the skill buttons… it was worth it, though, because this looks nice. I win, but my henchie monk was not so lucky. I still had a resurrection signet though, so that problem can be solved. 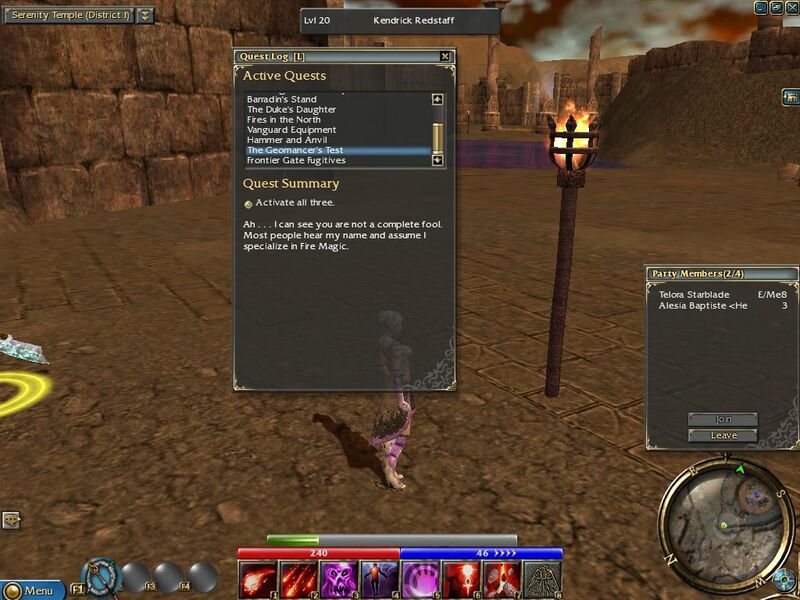 And indeed, just as promised, Ascalon has a lot more quests now! There definitely weren’t anywhere near as many quests in the game before. More content is good, and Arena.net did a good job of packing the game with things to do. And here’s another one of those giant paintings of Balthazar. This beta had a pretty cool ending event, but as I said I either entirely missed it or took no screenshots of it, as I spent most of the end of the beta in multiplayer, mostly the Random Arenas. See the links at the end for some footage of the closing event from others. Tired of the Elementalist, I went back to my favorite, Talindra the Necromancer. 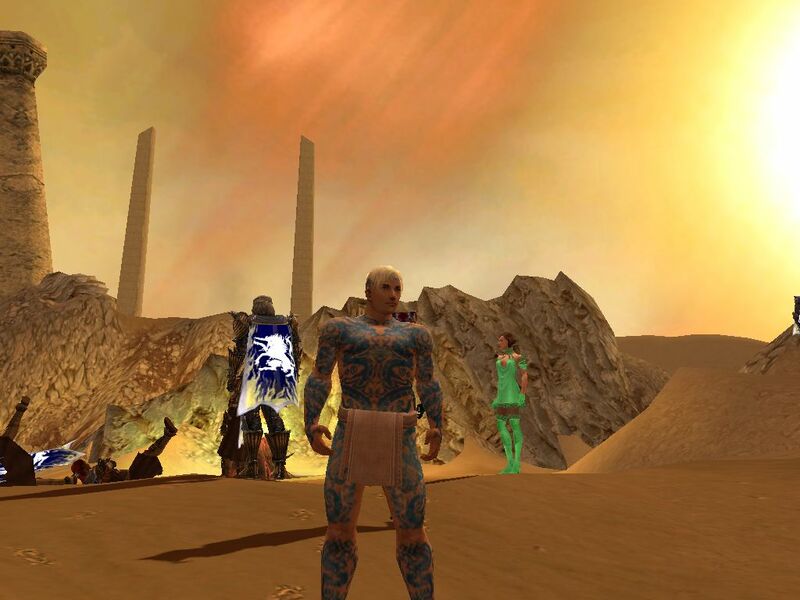 Here I am in the Tombs lobby, looking for a group and at the players’ antics, such as the people dancing in the background here. He’s fine, just upside-down. Heh. That doesn’t seem to have gone well, so it’s back to the lobby. Yes, in beta you really could find randomly assembled groups for Tombs. 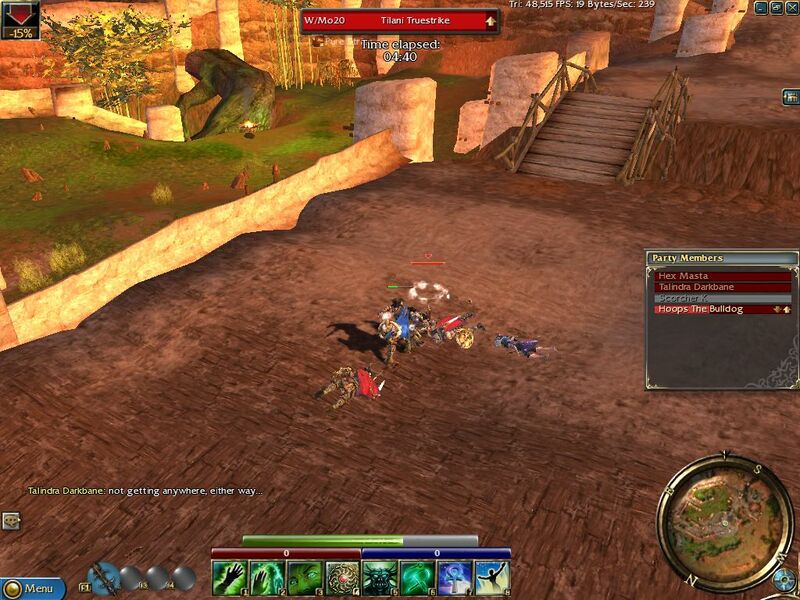 This would definitely not continue on into retail, better players stuck more to their guilds once the game was out. 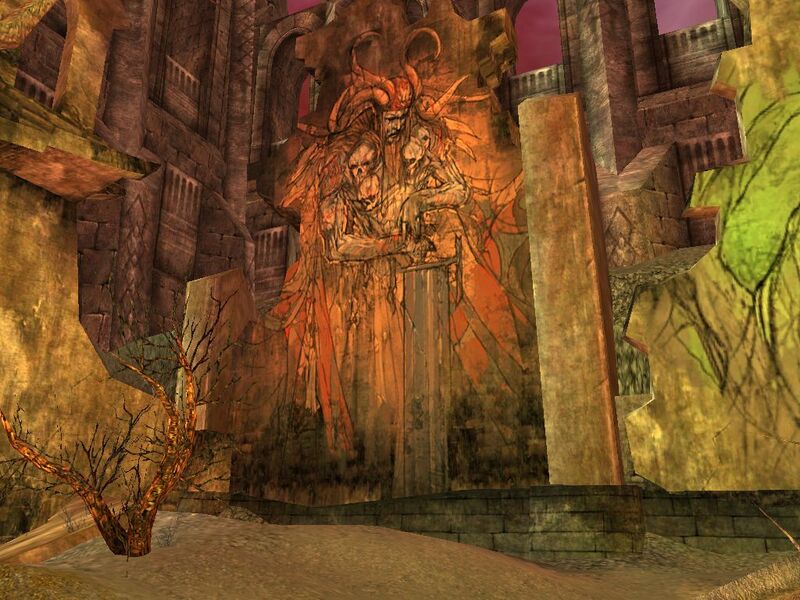 Finding random groups for missions and stuff was easy enough for several years, but for high-end PvP areas like Tombs? That quickly became much harder, and I stopped trying after not too long. You need good team coordination to win much in structured PvP areas like this, you see, and that’s hard to do with a mostly-random group. Guild Wars even has voiced cinematics now! It really is coming together. 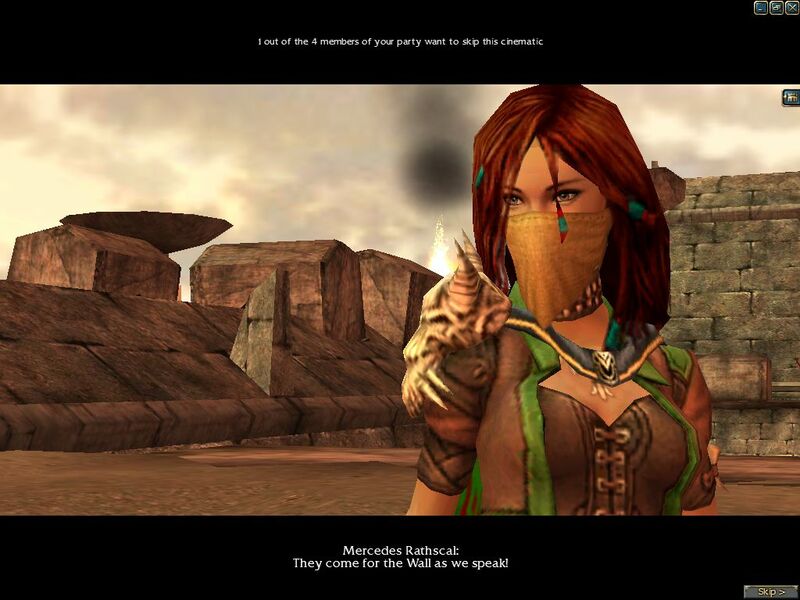 The first player in the group acts as the speaker in cutscenes, with two voice tracks, for male or female. If all human players hit the ‘skip cutscene’ button it’ll skip it, but it does require all to hit skip for it to be skipped. I often liked watching the cutscenes, even when I’d seen them multiple times before. Sometimes I did skip, though. Not this time, though. This beta is heading towards a conclusion, but some people are still trying to sell stuff in town. Yes, that’s right: capes are in the game, and I got one! 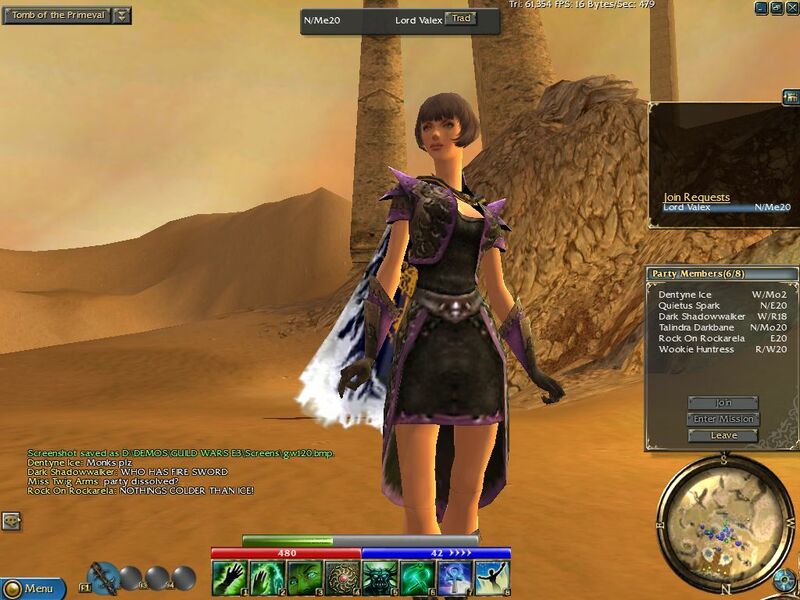 Back in the earlier betas Guild Wars had little tabards instead of these capes, but they were removed because people didn’t like them, and Arena.net came back with these. I had to save up for mine so I only got it here, but here it is, a guild cape with, of course, the closest recreation I could of a Black Falcon Lego shield logo on it. 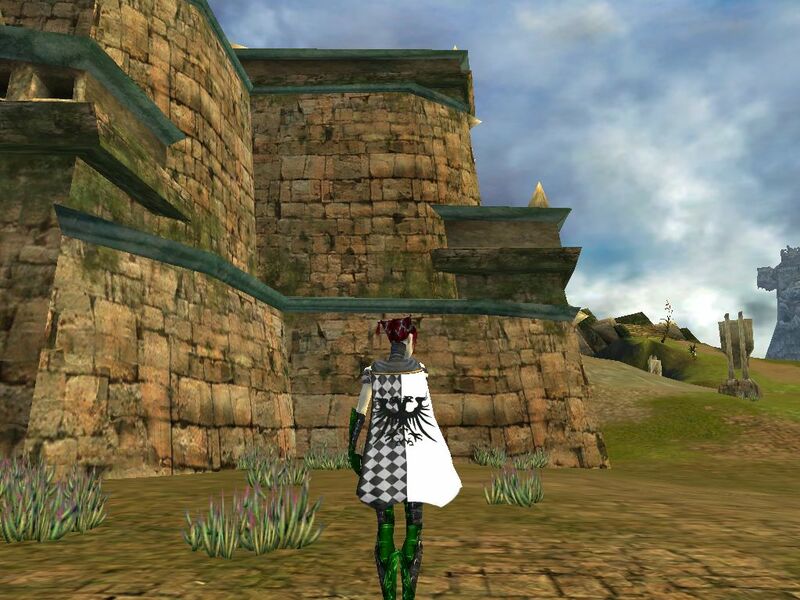 It’s a great cape and is very similar to the one I have now. GW’s capes look great. Yes, having a cape really adds to your characters. Meanwhile, chat’s zipping along. But instead of sticking around for the full ending event, I decided to go to the random arena instead. I’m not sure if I saw any of that infamous event, honestly, but if I did I didn’t take screenshots of it. Random arena battles in GW are something I have always loved. It’s a perfect balance of strategy and fun, as you don’t need to be as serious as you would in the higher-end PvP areas and many skill builds work, but it still is very much a skill-based mode where better builds will work better. And looking at my build here, I was clearly heading in the direction I’ve gone in ever since, towards a strong focus on the Blood skill line, with Dark Pact and Life Syphon as some of my key skills. I hope you’re not doing that WHILE also playing in this PvP match… heh. That’s for sure, me, I definitely like the regen skills the most! 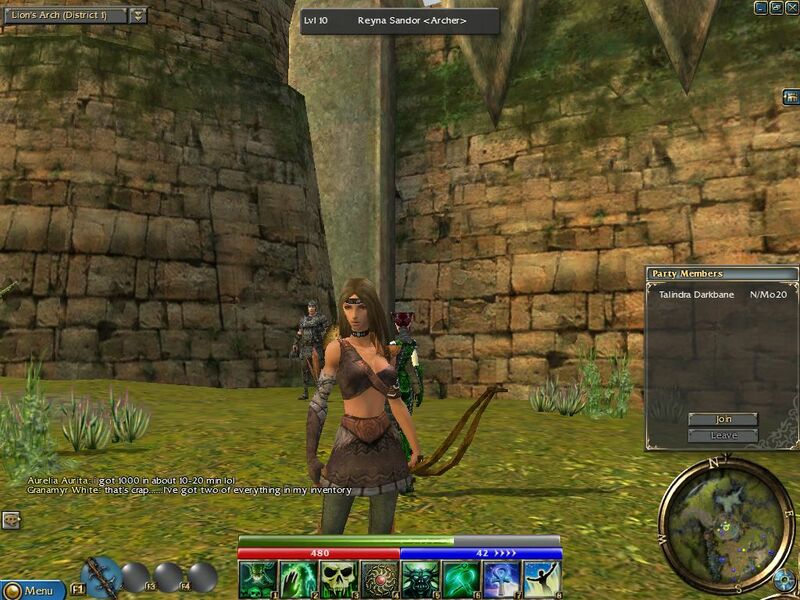 Regen and degen are some of my favorite things in Guild Wars, as far as skills go. On the other hand though, we lost… oh well. It was a lot of fun while it lasted. Yup. I don’t think it got out of this loading screen, we were just forced back to the login. So what did I presumably miss out on while I was in the arena? Well, the closing event in the March beta here involved a lot of Gwens spawning everywhere and burning people with fire while saying all kinds of amusingly creepy things. 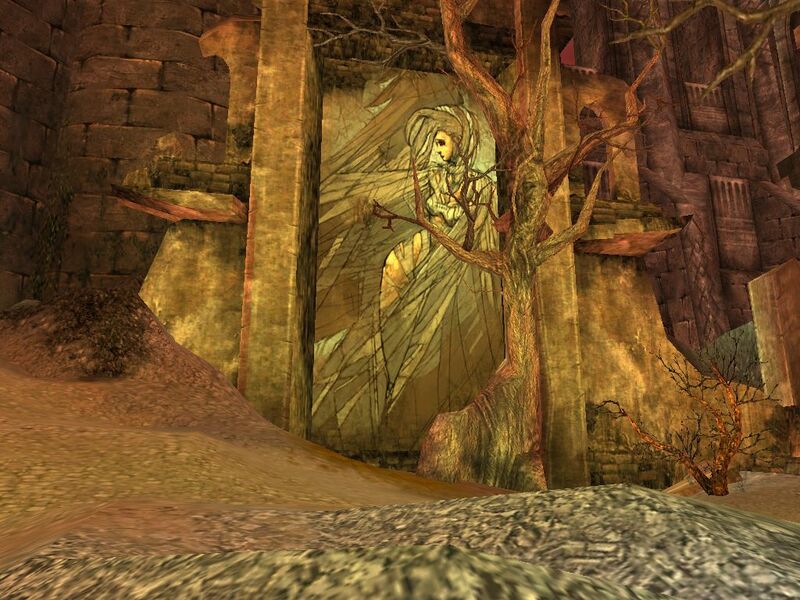 Specifically, we’re talking about child Gwen here, from pre-Searing. 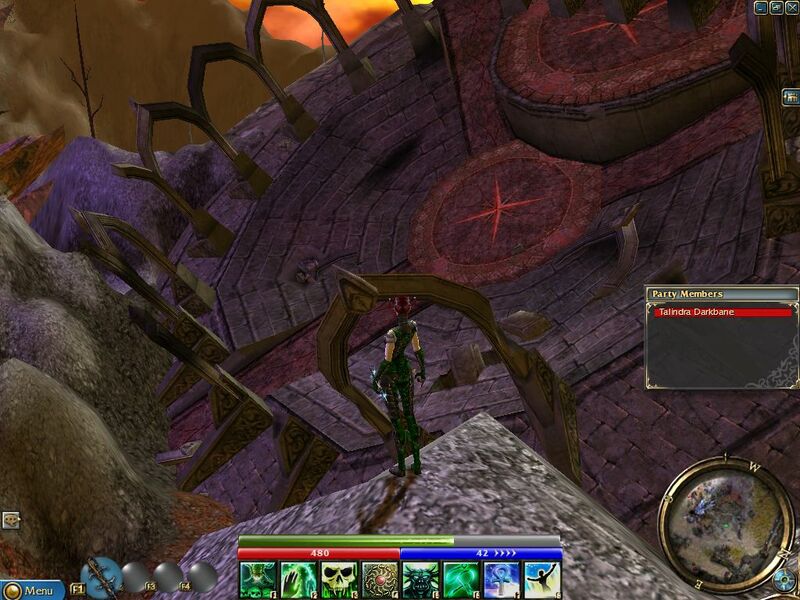 Gwen, the character in the main game, wouldn’t appear until several addons in; in Prophecies there were a few hints that she might have survived, but no proof. Anyway, she was very much in this beta, killing people. 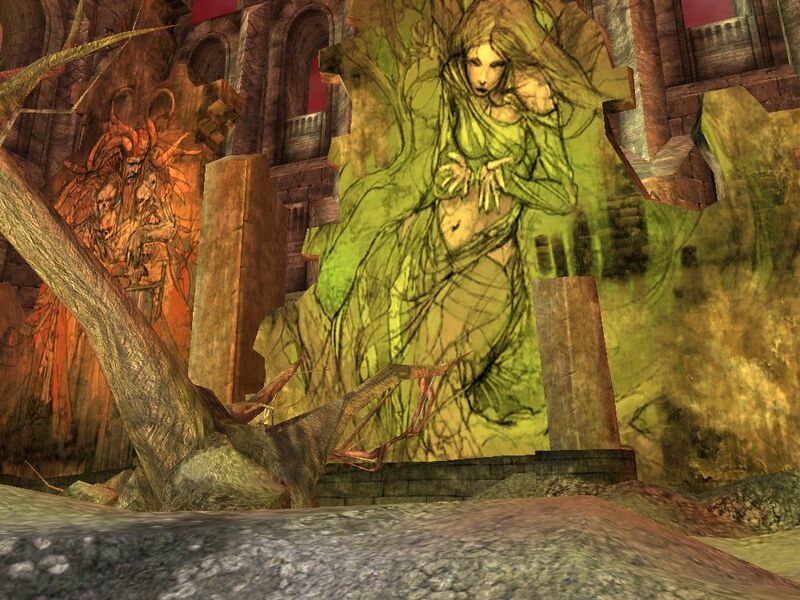 The GW Wiki has a list of all the things the many Gwens that spawned said during this event: https://wiki.guildwars.com/wiki/Gwen (“Beta Weekend Event” category). https://www.youtube.com/watch?v=o1kW7pNFW-k (warning: language) – The Gwens spawn about two minutes into this video.